Capacity: 30 ml. & 60 ml. With highly driven technical excellence, we have been able to offer our clients with feature-loaded Stool Container. - Used for sample collection in hospitals and labs. These containers are made of polypropylene and with spoon and screw cap. We are lead manufacturer and supplier of wide range of quality Stool Containers. 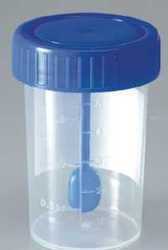 These can be used for collecting a wide range of samples of sputum, urine etc. Containers, as the name suggests, are used for collecting stool samples. The cap is provided with a spoon like structure that proves helpful in lifting samples. We are offering Stool Container to our client.